A garden may end at the property line, but knowledge of its flowers and berries can extend to the whole neighborhood in the insect and animal world, and this knowledge may even be carried by migrating birds thousands of miles away. Life in a neighbor’s yard or in a nearby creek may be influenced by what we plant and add to the soil-fertilizers, pesticides, and water. Within the garden, connections between the soil, microorganisms, plants, wildlife, and our activities are infinitely more closely knit, so any action we take may have many unintended consequences. Planting a thirsty azalea under a native oak may kill the tree; fertilizing a rose may attract aphids to rank new growth, and spraying for aphids in this area may kill insects that control aphids elsewhere in the garden. If you have the urge to plant a silver birch or a sweet gum that reminds you of your home state, you should realize that it may not thrive in our watershed, and will play a negligible part in the ecology of your garden. In general, choosing plants native to a region of similar climate to ours-and especially choosing those plants native to this area-will lead to easier and lower cost gardening, and can provide the joy of providing a welcoming habitat for butterflies and hummingbirds and other insects and birds. If we also, as much as possible, use natural fertilizers and avoid chemical pesticides, we will be returning a little piece of our valley to nature’s realm. Some visually appealing California native plants that are suitable for gardens in the Corte Madera Creek watershed and attractive to wildlife are listed below. Trees: black walnut (Juglans californica), buckeye (Aesculus californica), coast live oak (Quercus agrifolia), valley oak (Quercus lobata), wax myrtle (Myrica californica). Shrubs: California mock orange (Philadelphus lewisii), California rose (Rosa californica), ceanothus (Ceanothus spp. ), coffeeberry (Rhamnus californica), creek dogwood (Cornus sericea), elderberry (Sambucus mexicana), flowering currant (Ribes sanguineum), holly-leafed cherry (Prunus illicifolia, Oregon-grape (Mahonia spp. ), lupines (Lupinus spp. ), manzanitas (Manzanita spp. ), ocean spray (Holodiscus discolor), redbud (Cercis occidentalis), silktassel bush (Garrya elliptica), spicebush (Calycanthus occidentalis), sticky monkey-flower (Mimulus aurantiacus), toyon (Heteromeles arbutifolia), twinberry (Lonicera involucrata). Vines: California pipevine (Aristolochia californica), honeysuckle (Lonicera hispidula). Flowers: buckwheats (Eriogonum spp. ), California fuchsia (Epilobium canum), California poppy (Eschscholzia californica), columbine (Aquilegia formosa), coyote mint (Monardella villosa), Douglas iris (Iris douglasiana), goldenrod (Solidago spp. ), matilija poppy (Romneya coulteri), milkweeds (Asclepias spp. ), mugwort (Artemisia spp. ), seaside aster (Aster chilensis), yarrow (Achillea millefolium). Suitable non-native plants that have low water needs and attract butterflies and insects that control pests. Shrubs: buddleia (Buddleia spp. ), chaste tree (Vitex agnus-castus), lantana (Lantana spp. ), lavender (Lavandula spp. ), rose of Sharon (Hibiscus syriacus), rosemary (Rosmarinus officinalis). Flowers: sweet alyssum (Lobularia maritima), bee balm (Monarda spp. ), cosmos (Cosmos bipinnatus), dill (Anethum graveolens), feverfew (Chrysanthemum parthenium), fleabane (Erigeron spp. ), flowering tobacco (Nicotiana spp. ), Queen Anne’s lace (Daucus carota), salvias (Salvia spp. ), pincushion flower (Scabiosa spp. ), Shasta daisy (Chrysanthemum maximum), St. Catherine’s lace (Eriogonum giganteum), verbenas (Verbena spp.). Nearby nurseries (wholesale and/or retail) selling native plants include: O’Donnell’s Nursery (453-0372), Fairfax; and Sunnyside Nursery (453-2701), San Anselmo. Green Jean’s (389-8333), Mill Valley; and Mostly Natives (707 878-2009), Tomales. California Flora (707 528-8813), Fulton; North Coast Native Nursery (707 769-1213), Petaluma; Wayward Gardens Nursery (707 829-8225), Sebastopol; and Western Hills Nursery (707 874-3731), Occidental. 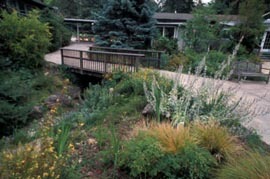 Much useful information on good gardening practices, such as mulching, composting, drip irrigation, plant diversity and integrated pest management can be found through Marin County Stormwater Pollution Prevention Program (MCSTOPPP), and through the Garden Education Program at the Marin Art and Garden Center, in Ross. If you are fortunate enough to live by a creek, you have a great opportunity to benefit local wildlife by planting native trees, shrubs, and groundcovers on the bank. These can also be helpful in stabilizing an eroding bank; some contractors specialize in such bio-technical solutions. Some non-native plants are especially invasive in our creek corridor, and prevent the regeneration of native species, so if possible avoid planting non-native invasive plants in creekside yards. Yard debris should not be deposited on the creek bank, as it smothers vegetation and suffocates fish when it decays in the water, while doing nothing to prevent erosion. Remember that drawing water from the creek or nearby well for irrigation deprives aquatic life of a very scarce resource, and requires registration with the state; it is better to use your MMWD hook-up.